Oversaturation of Star Wars content in the media recently has been a hot topic ever since Solo flopped at the box office and The Last Jedi was met with a mixed reaction from fans. While some fans have been embracing the steady stream of new content in the form of books, comics, films and TV shows, others feel that the amount of content that Lucasfilm is churning out has been too much to keep up with. As it turns out, Bob Iger agrees. 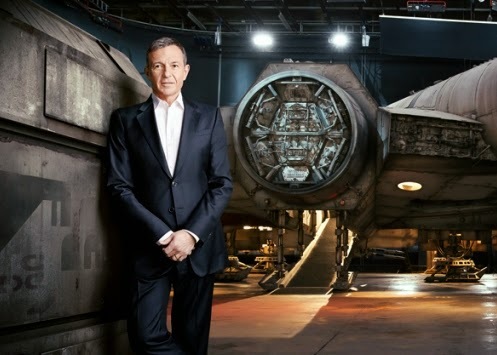 In an exclusive interview with the Hollywood Reporter, Iger admits that he may have made a mistake by producing too much new Star Wars content too quickly. While he says that there will be “some slowdown,” they’re not going to cut out films entirely. He refers specifically to the trilogy handed off to Game of Thrones creators David Benioff and D.B. Weiss, admitting that while the trilogy is still planned, no specifics have been discussed. He does, however, fail to mention the trilogy deal that Rian Johnson accepted before the release of The Last Jedi, which has faced rumors of cancellation in the past few weeks. While he specifically addresses his thoughts regarding the timing of the films, he doesn’t go into detail about the rest of the media they are putting out. Star Wars: Resistance is set to release in October on Disney’s new exclusive streaming service, and it seems that the live action TV show is still on as planned. With the Poe Dameron comic series wrapping up next week, it’s hard to say if other comic series are going to pop up to replace it, or if we will experience a slowdown in literature as well. While Bob Iger does admit that he made a mistake in regards to the timing of the films, I think that he overlooks a larger issue: quality versus quantity. When Rogue One debuted a year after The Force Awakens, it didn’t feel like “too much Star Wars” to have a new film every year. Rogue One played off an old story, but it still felt fresh and original. It kept audiences engaged with the Star Wars brand without seeming excessive. Things went south with the release of The Last Jedi. While its bold, new direction was stanned by critics, most of the film’s reception by fans has been negative, as the film opted to divert sharply from the story set up by its predecessor. While admitting timing is an issue, Iger fails to admit that they dropped the ball creatively when they decided to split the new trilogy between three directors. While J.J. Abrams, Kathleen Kennedy, and even Daisy Ridley have admitted that there was a discussion about Rey’s background and future, Rian Johnson was given license to take the story wherever he wanted it to go – and he did. He ignored the characterizations and plot threads that were already set in place and created his own story, one that was in the Star Wars universe, but lacked the transition necessary for a proper trilogy. This disappointment was when fans started to distance themselves from the franchise. After all, if Disney can’t put out a competent product and make sure they tell a cohesive story, why should they invest themselves in it? This new apathy can be partially attributed to why Solo flopped – if The Last Jedi couldn’t keep something as basic as plot continuity in check, why risk watching them besmirch one of the most beloved characters of the original trilogy? The other clear problem with Solo is that no one asked for it. No one is looking to see how Han Solo got to be the way he is. It’s part of the charm of his character. There should be some magic left for audience to decide Han’s formative years on their own: not every specific detail and nuance needs to be explored in depth. And there’s really no good reason to explain why. Businesses stay in production by making products that people want to see. Star Wars has already proven itself to be a popular brand, among children and adults alike, but recently they haven’t been producing content that people want. It develops a trilogy with no continuity. It releases a prequel film about an old character when most fans have vocally expressed interest in something else. Even amid loud cries for an Obi-Wan movie, hint of a Boba Fett movie was dropped instead. While a small minority has been clamoring for the film for years, it’s the Obi-Wan film that fans have expressed a clear interest in. So why isn’t anyone listening? Bob Iger admits that he made a mistake in regards to volume and timing, and while it’s important to be wary of oversaturation of the market, volume really isn’t the issue. The problem is the lackluster products that they keep producing, expecting fans to gobble it up simply because it has the Star Wars logo plastered over it. In a time when streaming services are producing their own content and more media is available to consume than ever before, Star Wars needs to be better than average. It needs to be good. And right now, it isn’t quite there. J.J. faces an immense amount of pressure, not only in terms of finding a satisfying end to the trilogy, but because that trilogy will affect fan’s perception of the brand going forward. If it’s a hit, fans might be willing to give a new trilogy a chance. Diehard fans who have been following the saga for decades definitely will. But casual fans who are only in it for a good story? They may give the trilogy a hard pass, along with any other films tied to the franchise going forward. The recent quality of the films has definitely been a problem, but it’s good to hear that those are the top are at least aware that this is a complex issue that is going to take time to solve. If waiting a few years between films is the only way to guarantee a great story with an excellent cast that looks and feels like Star Wars, then I think most of us can agree that it’s worth waiting for. As long as they don’t make us wait too long. You nailed it. Disney just can’t accept that TLJ was a bad movie, with a bad story, that didn’t properly follow the story laid down in TFA. Kathleen Kennedy, and the lack of proper direction of an overall story, is to blame. Marvel has done things so right with the movies, and only gotten better. Star Wars needs that type of leadership and direction. You are both right ScytheNoire and Krasava M. In my opinion, the Last Jedi was a bad film but not intentionally so. They made it bad because they couldn’t write a coherent script. ( And despite what some feminists claim, the female characters had it much worse than the male ones). The Original and the Prequel trilogy films were both supervised by George Lukas and we had one film every three years (instead of one in every two). Thus they had a much more specific framework to develop the story and much more time to iron out the errors in the script. And they were trilogies! Not like here where Episode VII and VIII had almost no connection. Another reason is that hardly anyone accepts blame for a mistake in our world and executives are no exception (it happens with my real life bosses as well and I don’t work in the entertainment industry). And the final reason is because frankly many executives are bad listeners. Let’s say you worked in Disny and had warned the producers of TLJ or one of the other films that the story is bad, that you don’t need that many characters in it (example: you didn’t need Holdo because Leia could have spoken the same lines and she is a far more recognisable character) or that some some ideas in the script are silly (Spaceships running out of fuel? After seven films the never had such a problem? Really? ). What would they do? Carefully listen, consider your points, and make adjustments or ignore/fire you while accusing you for not sharing the team’s vision/not being a team player/being an idiot? Probably the latter.